When Google announced that they were bringing AMP to the main organic search results – the “ten blue links” – they specifically said there would be no ranking boost associated with AMP. To clarify, this is not a ranking change for sites. However, many are still questioning whether there is or isn’t a boost for AMP, so it seems as though some more clarification is needed. 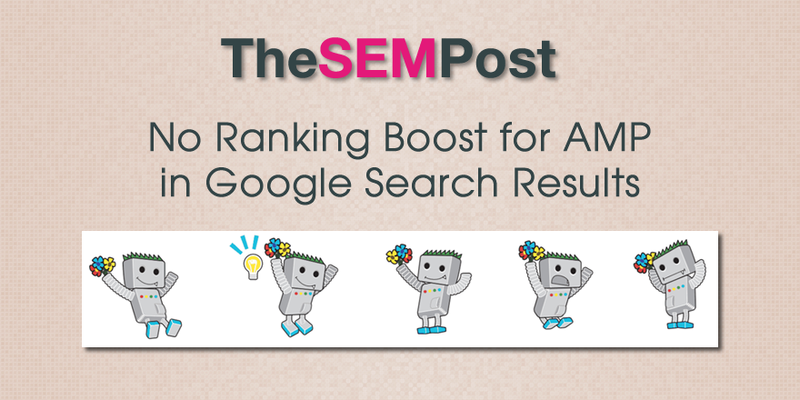 There is NOT a ranking boost associated with AMP. So sites will not get any kind of additional ranking boost for using AMP, nor will a site be penalized in any way because they decide not to implement AMP. John Mueller also confirmed it on Twitter. @saucisson No – there's currently no ranking difference for AMP URLs. If a site only has AMP as their mobile version of the site, then the AMP version of the page would get a boost, but it is still only the regular mobile friendly boost that any mobile friendly page gets, and nothing specifically for AMP.